Uruguay is a fairly unknown surfing destination, despite being neighbours with Brazil and having local riders paddling out as early as the late ‘50s. Omar “Vispo” Rossi began standing up on a homemade board, not even knowing he was “surfing”, in Praia de Pocitos, one of the most exposed beaches in Montevideo. There are more than 80 breaks scattered along just 200kms (124mi) of Atlantic coast, with a very small number of surfers compared to the giant surfing nation to the north. There’s everything from left or right pointbreaks to beachbreaks, not to mention the rivermouths and even outer reefs with big waves. Some of the best spots are not easy to get to and that is why they are seldom crowded. Knowing where to look can yield fun, mellow waves in the middle of the summer, with only the seagulls for company. In winter, the South Atlantic can be pretty consistent with lows forming between the Falklands and Argentina, veering on a NNE path towards Africa. 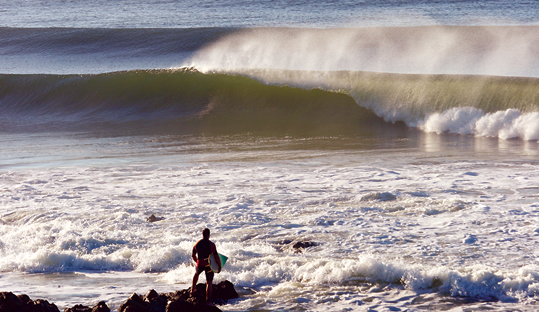 Swells are quite regular, reaching 12ft+ (4m+) and 4-10ft (1.2-3m) is the mean range for winters. Autumn is the best season with slightly less consistency and intensity but cleaner conditions. Summers are really small, often going flat and anything under 3ft swell will not do much. The best time to surf in Uruguay is from April to November, even though in July, August and September the water sometimes drops to 10ºC (50ºF) and the air can get close to 0ºC (32ºF). In winter a 4/3 mm with boots, in autumn and spring a 3/2mm without boots and a short john or boardshorts in summer. Onshore winds are frequent after mid-morning and the best winds are S-SW for rights and NE-NW for lefts. As in most temperate climates, rainfall results from the passage of cold fronts in winter, falling in overcast drizzly spells. Summer thunderstorms are frequent when high humidity and fog are common. The absence of mountains makes the coast vulnerable to rapid changes in weather. Seasons are fairly well defined, spring is usually damp, cool, and windy, summers are warm, autumns are mild and winters are chilly and uncomfortably damp. Average highs & lows in summer (January) in Montevideo are 28°C (82ºF) and 17°C (63ºF), while winter (July) averages 14°C (58ºF) and 6°C (43ºF). Rainfall is fairly evenly distributed throughout the year (950mm/38in annually). A winter warm spell can be abruptly broken by a strong “Pampero”, a chilly and sometimes violent SW wind blowing in from the Argentina pampas. Take a sunset stroll along Gorlero Avenue, Punta del Este’s main place to see and be seen. In a few blocks there’s restaurants, bars, shops, cinemas and the Feria Artesanal. Isla de Lobos, 8 km offshore, is one of the world's largest sea-lion colonies. Whales may be seen October-November. Easter is Semana Criolla when people from all around hit the capital to party. Aside from rocks & some jellyfish in summer, things are pretty safe. No aggressive crowds, very little thievery, not much urban pressure (not Brazil). Avoid Punta del Este tourist traps in summer. Wind changes are fast and without warning so surf when you see good waves. There are surf shops, shapers and board repairs in the main beach towns. Equipment is cheap and decent quality. Use a thicker, longer board for the mellow waves. Surf Lessons with all equipment is $100 per 6 classes. Surfboards rental $20/day, wetsuit $10/day.